There have been nearly two decades of seminal studies conducted by leading universities from around the world which analyzed and correlated soil nutrients to wine flavors. These preeminent studies and research observed and analyzed the process of nutrients and micro-nutrients in regards to taste perception, but only with chemical free wines. Once chemicals are employed as with almost all wines and vineyards in today's world, such studies could not have been conducted with any unimpeachable science or reliable results. 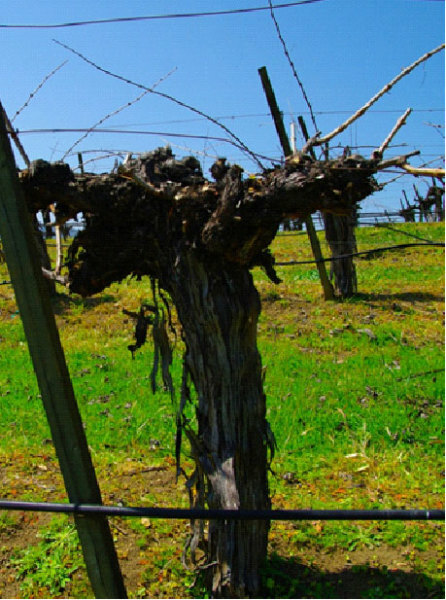 The research only involved natural vines, on their own root, not GMO vines crowded together in dense plantings also endemic in vineyards today. The Project Title: Assessing the Relationship of Wine Quality to Soil Type: A joint project between Cal Poly Earth and Soil Sciences & Food Chemistry, Food Science, Nutrition, & Statistical Departments, John Deere Global Ag. Services, State of California, Earth Information Technologies Inc., Motorola, providing atmospheric and soil monitoring stations, as well as the vineyards and natural cellar wine-making facility of Carmody McKnight. This project led to other distinguished university studies which established the nexus between mineral complexity of the soil, GMO-free vine plants, and the resulting health attributes of wine as well as natural and more desirable chemical-free flavors in wine. See description of university project. This is what a non-GMO, own-rooted vine nurturing in prolific soils looks like. For thousands of years all grape vines were similar... then genetically mutant hybrids started to proliferate, and now you see this no more in most vineyard areas of the world. Above is a 30-year non-GMO vine thriving on the Westside of Paso Robles. Our supervising board is comprised of five experts who are renowned in the fields of viticulture, earth science, vinicultural research and oenological examinations. Two vineyard proprietors and viticulturalists, who have decades of special vineyard experiences, also bring their unique qualifications, especially in relationship to genetic modification concerns and super-organic attributers. It would be very difficult to find anyone who could match all the boards backgrounds and unique research and investigations regarding wine growing, soil analysis, and climatology, specifically in light of the enormous GMO problem affecting all agriculture. Most importantly, the backgrounds of the board members are related to the salient issues of super-organic. as GMO-free, no chemical additives verified and super-organic in regards to their wine-making procedures and soil analysis. 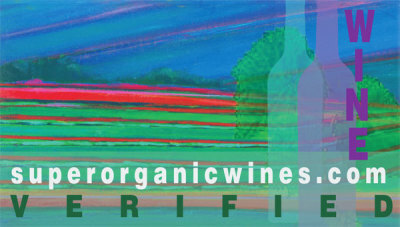 Wines seeking an ES Score which is a long qualifying process based on the Eco-dynamic Scale review, can also contact us.